Review by AllTheBestFights.com: 2015-04-10, pretty good finish between David Branch and Jesse McElligott but it is not enough to get three stars: it gets two. The black belt in Bjj David Branch entered this fight with a pro mma record of 15-3-0 (60% finishing rate) and he is ranked as the No.9 middleweight in the world. He suffered his last defeat in 2012 when he faced Anthony Johnson (=Johnson vs Branch), since then he has won five bouts winning the Wsof Mw title in 2014, against Jesse Taylor (=Branch vs Taylor), and defended it once with Yushin Okami (=Branch vs Okami). His opponent, Jesse McElligott (who replaces Ronny Markes that pulled out of the bout due to undisclosed reasons on the day of the weigh-in), has an official record of 5-1-0 (80% finishing rate) and he comes off two consecutive victories. 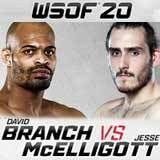 Branch vs McElligott, main event of WSOF 20, is the semifinal of the World Series of Fighting light-Hw tournament. Watch the video and rate this fight!